Just south of Areopolis, Tower Dyros, from here you can buy pottery and souvenirs at pretty good prices, as we descend the coastal location of caves Glyfada (or Fira), Shelter and Alepotrypa. Beneath the earth of maniatika is hidden an unspeakable beauty, the most beautiful lake cave in the world. It’s an underground river developed in two main parallel runways. Holds the first place among the three most beautiful lake caves in the world, the other two are Pantirak of Southern France and Zajc Beirut. Today the total length reaches 6000 meters. 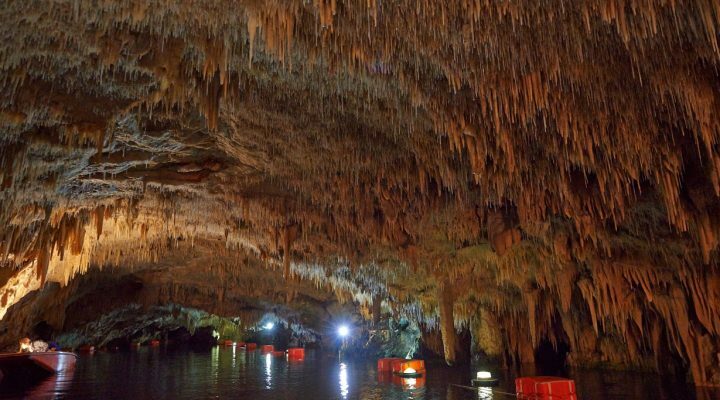 The cave consists of stalactites and stalagmites, and was formerly a land, but over the centuries the water level rose from the sea and so the formations of stalactites resemble white columns coming out of the water. No matter how many times you visit the caves Dyros not get enough of the eye to follow with admiration what he has offered as a gift of nature. For 45 minutes on a winding path, the visitor is left speechless. The journey through this magical world lasts about three quarters and enjoy the First Salad with the mantle of Neptune, a Dead State, at the crossroad with the Nereids and white teddy bear, the Lake Okeanidon the stone forest and the magnificent stalagmite of small haystacks. Here carvings unique beauty as the Episcopal throne, the sole of Poseidon, stone lily and a church crossing with the chandelier and the pulpit, the hall of Dyros to ancient Greek cloaks, the pink and white houses with the harp, the royal balcony , the gate and hanging fox and the end of the right path chapel. Then an artificial passage to the left leads to the Sea of ​​Wrecks, the sunken boat, we continue in the hall Golden rain in Chocolate Shala in the Red Room, and through a channel we see the Leaning Tower and opposite of the Nativity of Christ. Stunned are heading in the hall Big Ocean, 160 meters long and ςιτη a height of 30m., the long drive and the numerous fringes and the dreamed Lake, which is the mouth of the river to the sea, while on the side emerges the Gothic Hall and completes the lake route. In the onshore section that follows, we walk paths through some beautiful decorations and observe the Tomb of the Unknown Sailor, the palace of Pluto, the Stone Forest and Noufara. Throughout the year, the temperature reaches 18 ° with floor slightly higher than sea level and most of its surface is covered by water, which facilitates the visit by boat. The beach and a few meters further up there is another cave Alepotripa. The terrain is steep and inside the cave is not smooth. It progresses around 500 meters at different levels and in conference with stalagmites and stalactites and corridors from one plateau to another. Its area is 6,500 square meters, the main cave ends in a most beautiful lake depth of 6 m. The premises were used as dwellings in later period of the Neolithic age as indicated by the findings. Among the finds are tools, marble figurines and vases and shells and Neolithic stone ax. It is not open for the public, yet. Once the visitor come stunned by the cave Vlihadas can be directed cave Alepotripa located a few meters above. Therein lays the Neolithic Museum of Dyros where you can admire the rich discoveries that will give a complete picture of the life of Neolithic man. In front of the cave Alepotripa is Dyros beach with crystal clear, turquoise sea and pebbles, makes you want to swim in its waters. About the cave you can find on the site www.diroscave.gr or telephone 27330 52222 (fax 27330 54263} The cave is open to visitors 8:30 to 15:00 from October through May and 8:30 to 17:30 of June to September. This cavern has been described as the most impressive limnetic cavern of the whole world. It consists of three different caverns: the Alepotripae, Katafygi and Vlyxada that is the only one that is open for visits. 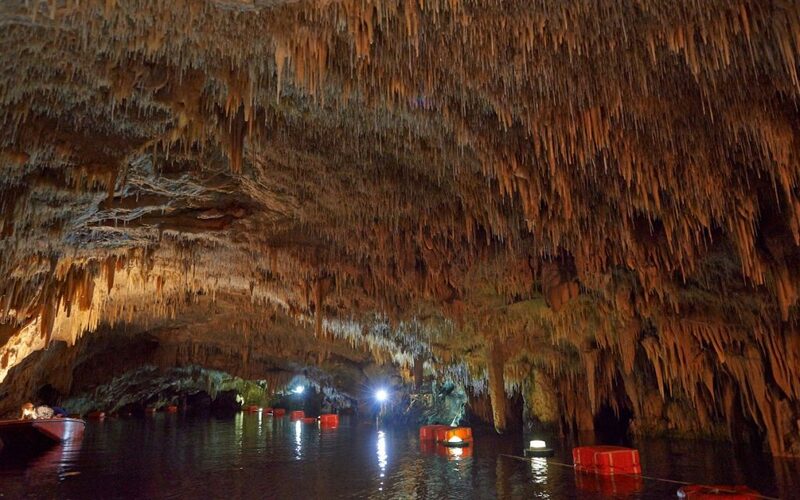 Those caverns were first explored in 1950 from the famous couple of speleologists Petroxeilou. The temperature in the interior area of the cavern is around 16-20o C and the water temperature is around 12ο C. You can explore the inside of the cavern with little boats along with the boatman showing you around and giving you information about the history of the cavern. The total length of the tour is about 1.2 km long on boat and 300m on foot and the duration is about 20-25 min by boat and another 5-10min by feet. Inside the Neolithic Museum that is located beside the cavern, you can see many priceless historical findings that can be dated back in the Paleolithic period. Diros caverns and the Neolithic museum are two of the most famous attractions for all Mani visitors. Here existed according to Pausanias, the temple of Tenariou Poseidon, who was worshipped especially by Lakones, and it became the center of the “Brotherhood of Freelakones”. It is said that the ancient temple of Poseidon was build near the chapel of Asomatos. They believe that they took stones and other materials from the ancient temple in order to build it. It is also noted in the writings of Pausanias and Ploutarhos that there was a Necro-temple that they made use of sciomancy in a small, desolated cavern in Tenaro. It is believed that there existed the entrance the Ades (underworld). Leave your car and follow the path that leads to the southest part of continental Europe and the Lighthouse of Tenaro. The distance is around 20-30 minutes by feet, but as soon as you get there you will be rewarded with the sense of ultimate freedom. The Lighthouse was built in 1882 by French, was renovated in 1950 and it still continues to offer its services to the local fishermen until today.